This kit may be retired, but it is still a darn cute kit and I have included great tips for you, in case you still have a kit unassembled at home. The coordinating stamp set, Tin of Cards, still available for purchase until May 31, 2017!!! Download the tips PDF here. These instructions coordinate with the ones in the kit. They will help make assembly that much easier. I have assembled several kits with my instructions. Adhesives: Tombo green multipurpose glue, SNAIL adhesive, fin tip glue pen, optional dimensionals. Tin of Cards stamp set still available until May 31, 2017!!! It is a very multipurpose stamp set. If holding kit as a class: pre-mount all the stamps, have cleaner or baby wipes on hand to clean between stamps. You do not have to stamp same greeting on all 4 coordinating cards (I did this on my first kit). Rather stamp that greeting on all the pieces you want. Ex: make a birthday card for each coordinating set of 4 cards. 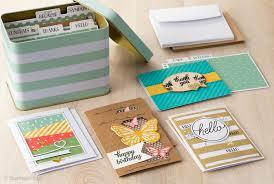 Be sure to clean stamp between each card piece, they might be stamped in different colors on each card. Please read entire TIPS sheet before proceeding on stamping. Stamp all of them at once, you will use black ink for all of them. Set aside a few minutes to dry. Glue paper on divider cards. Set in card tin. Pro tip: since the tin is re-usable, think about what type of cards you send out on a regular basis, use those types as your divider card headers. Follow instructions in kit. No other tips. Cut your bakers twine into 4 even pieces. It wraps about 3 times around 4 fingers or 4 times around 3 fingers. Use StazOn ink on the woodcut. Adhere the yellow strip onto blue card base first. Line up the ++++++++++ stamp so it is just to the edge of the card. You will stamp it 4 times. No need to fill in the middle as that will be covered up by the woodcut image. Stamp butterflies while still on sheet. Stamp banner greeting in Memento ink or Archival ink. Punch out large butterflies. Stamp on a piece of scratch paper. I used stars in Crushed Curry on large butterflies. No right or wrong here. Keep butterfly cut out plain side up, place vanilla butterfly on top rather than cut out solid. Cut gold thread into 4 even sections. Use dimensionals or glue dots to adhere to back of large butterflies. Stamping the scallop edge: stamp edge in reverse on bottom. You will have some extra items. Feel free to use on other projects.